"CBS News: 50 Years Later, Civil Rights," moderated by Bob Schieffer features civil rights activist Harry Belafonte, U.S. Rep. John Lewis, actress Whoopi Goldberg and others. Watch the full symposium here, and more here. In the hot and deadly summer of 1964, the nation’s eyes were riveted on Mississippi. Directed by award-winning documentary filmmaker and MacArthur "Genius" Fellow Stanley Nelson (Freedom Riders, The Murder of Emmett Till), FREEDOM SUMMER highlights an overlooked but essential element of the Civil Rights Movement: the patient and long-term efforts by both outside activists and local citizens in Mississippi to organize communities and register black voters — even in the face of intimidation, physical violence and death. The Freedom Summer story reminds us that the movement that ended segregation was far more complex than most of us know. American Experience will broadcast the film this summer, which marks both the 50th anniversary of Freedom Summer and the one-year anniversary of the Supreme Court's Shelby County v. Holder decision, which struck down key protections afforded by the landmark civil rights legislation borne of the political momentum generated by this historical movement — The Voting Rights Act of 1965. Film by Emmy award-winner Stanley Nelson followed by panel discussion with veterans of the 1964 Freedom Rides. The event is part of the Bronx Documentary Center’s summer exhibition and program series, The 60s: Decade of Change. Watch online via PBS here. Then, stroll over and preview the Steve Schapiro exhibition "Once Upon A Time in America". The gallery will be open Friday, July 4 from 9 to 3, and Saturday July 5 from 10 - 5. There will be a public reception welcoming the renowned photographer Steve Schapiro to Santa Fe and celebrating the official opening of his exhibit from 5 - 7 Saturday evening. More than 50 iconic photographs by LIFE veteran Steve Schapiro go on display this Saturday at Monroe Gallery’s Once Upon a Time in America. Over the last five decades, Schapiro has documented the transcendent and the mundane surrounding some of the country’s greatest battles, accomplishments and cultural milestones—ranging from Robert F.Kennedy’s 1968 presidential campaign to candid moments depicting Marlon Brando on the set of The Godfather. A lifelong practitioner of the craft, Schapiro developed a love for photography at age 9, when he would try to emulate the shots of the father of photojournalism, Henri Cartier-Bresson. “This is a show about America and different aspects of America,” Schapiro tells SFR from his Chicago home. Aspects like 1965’s MLK-led Selma to Montgomery marches. 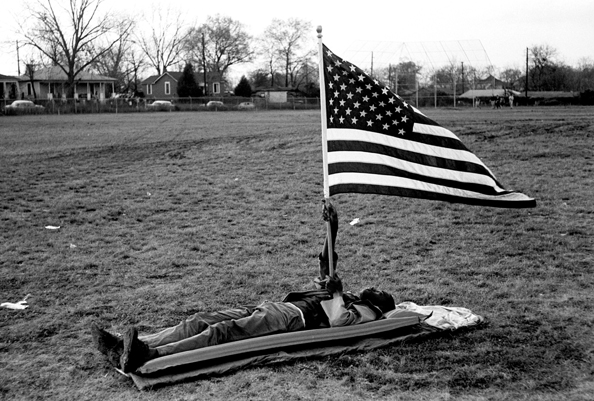 Witnessing several interruptions and threats of violence during the marches, Schapiro kept on shooting and at one point captured a youth resting under the shadow of an American flag. “It’s symbolic of the spirit that kids have regarding their feelings that things were only going to get better, and that nonviolence was the proper course to take." That particular picture wasn’t selected by magazine editors at the time, but was like many in his oeuvre, one that came to be by chance after he went through his old contact sheets. Join us Saturday, July 5, from 5 - 7 PM for a public reception with Steve Schapiro for the opening of the new exhibition "Once Upon A Time in America".